The domain within your query sequence starts at position 403 and ends at position 525; the E-value for the ArfGap domain shown below is 4.62e-56. 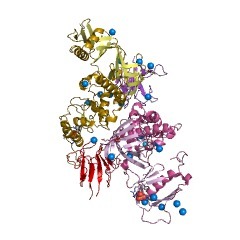 Putative zinc fingers with GTPase activating proteins (GAPs) towards the small GTPase, Arf. The GAP of ARD1 stimulates GTPase hydrolysis for ARD1 but not ARFs. 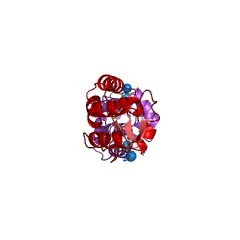 Proteins containing this domain include ARF1-directed GTPase-activating protein, the cycle control GTPase activating protein (GAP) GCS1 which is important for the regulation of the ADP ribosylation factor ARF, a member of the Ras superfamily of GTP-binding proteins [(PUBMED:9446556)]. The GTP-bound form of ARF is essential for the maintenance of normal Golgi morphology, it participates in recruitment of coat proteins which are required for budding and fission of membranes. Before the fusion with an acceptor compartment the membrane must be uncoated. This step required the hydrolysis of GTP associated to ARF. 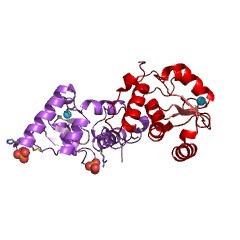 These proteins contain a characteristic zinc finger motif (Cys-x2-Cys-x(16,17)-x2-Cys) which displays some similarity to the C4-type GATA zinc finger. 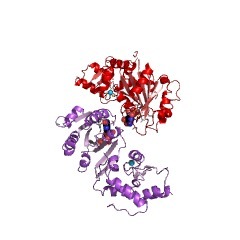 The ARFGAP domain display no obvious similarity to other GAP proteins. 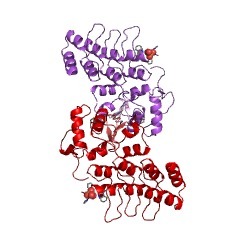 The 3D structure of the ARFGAP domain of the PYK2-associated protein beta has been solved [(PUBMED:10601011)]. It consists of a three-stranded beta-sheet surrounded by 5 alpha helices. 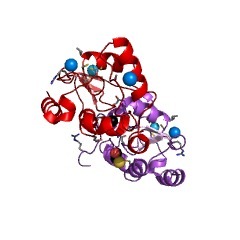 The domain is organised around a central zinc atom which is coordinated by 4 cysteines. 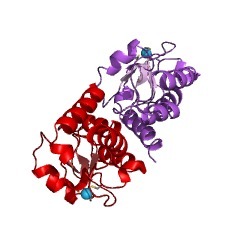 The ARFGAP domain is clearly unrelated to the other GAP proteins structures which are exclusively helical. Classical GAP proteins accelerate GTPase activity by supplying an arginine finger to the active site. The crystal structure of ARFGAP bound to ARF revealed that the ARFGAP domain does not supply an arginine to the active site which suggests a more indirect role of the ARFGAP domain in the GTPase hydrolysis [(PUBMED:10102276)]. There are 21774 ArfGap domains in 21759 proteins in SMART's nrdb database. Taxonomic distribution of proteins containing ArfGap domain. This tree includes only several representative species. The complete taxonomic breakdown of all proteins with ArfGap domain is also avaliable. Click on the protein counts, or double click on taxonomic names to display all proteins containing ArfGap domain in the selected taxonomic class. Molecular characterization of the GTPase-activating domain of ADP-ribosylation factor domain protein 1 (ARD1). ADP-ribosylation factors (ARFs) are approximately 20-kDa guanine nucleotide-binding proteins recognized as critical components in intracellular vesicular transport and phospholipase D activation. Both guanine nucleotide-exchange proteins and GTPase-activating proteins (GAPs) for ARFs have been cloned recently. 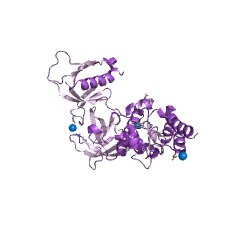 A zinc finger motif near the amino terminus of the ARF1 GAP was required for stimulation of GTP hydrolysis. ARD1 is an ARF family member that differs from other ARFs by the presence of a 46-kDa amino-terminal extension. We had reported that the ARF domain of ARD1 binds specifically GDP and GTP and that the amino-terminal extension acts as a GAP for the ARF domain of ARD1 but not for ARF proteins. 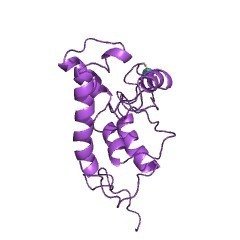 The GAP domain of ARD1, synthesized in Escherichia coli, stimulated hydrolysis of GTP bound to the ARF domain of ARD1. Using ARD1 truncations, it appears that amino acids 101-190 are critical for GAP activity, whereas residues 190-333 are involved in physical interaction between the two domains of ARD1 and are required for GTP hydrolysis. 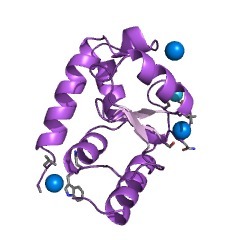 The GAP function of the amino-terminal extension of ARD1 required two arginines, an intact zinc finger motif, and a group of residues which resembles a sequence present in Rho/Rac GAPs. 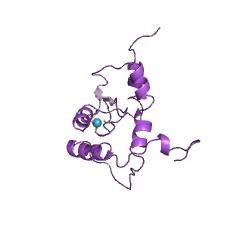 Interaction between the two domains of ARD1 required two negatively charged residues (Asp427 and Glu428) located in the effector region of the ARF domain and two basic amino acids (Arg249 and Lys250) found in the amino-terminal extension. 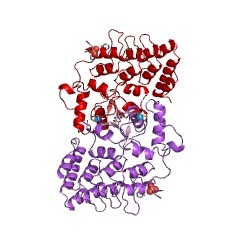 The GAP domain of ARD1 thus is similar to ARF GAPs but differs from other GAPs in its covalent association with the GTP-binding domain. 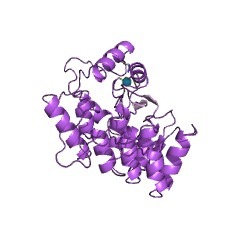 A target of phosphatidylinositol 3,4,5-trisphosphate with a zinc finger motif similar to that of the ADP-ribosylation-factor GTPase-activating protein and two pleckstrin homology domains. We have purified a protein that binds phosphatidylinositol 3,4,5-trisphosphate [PtdIns(3,4,5)P3] using beads bearing a PtdIns(3,4,5)P3 analogue. 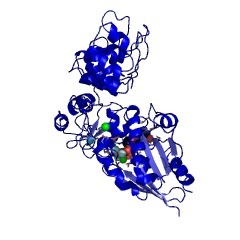 This protein, with a molecular mass of 43 kDa, was termed PtdIns(3,4,5)P3-binding protein. The partial amino acid sequences were determined and a full-length cDNA encoding the protein was isolated from bovine brain cDNA library. 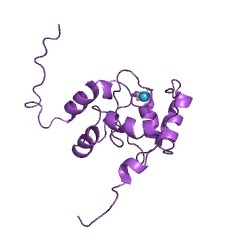 The clone harbored an open reading frame of 373 amino acids which contained one zinc finger motif similar to that of ADP-ribosylation-factor GTPase-activating protein and two pleckstrin homology domains. 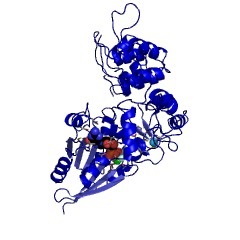 The entire sequence was 83% similar to centaurin alpha, another PtdIns(3,4,5)P3-binding protein. The protein bound PtdIns(3,4,5)P3 with a higher affinity than it did inositol 1,3,4,5-tetrakisphosphate, phosphatidylinositol 4,5-bisphosphate, phosphatidylinositol 3,4-bisphosphate, and phosphatidylinositol 3-phosphate suggesting that the binding to PtdIns(3,4,5)P3 was specific. 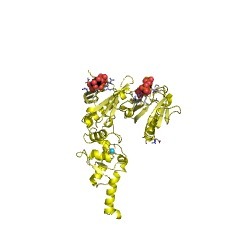 The binding activity was weaker in the mutants with a point mutation in the conserved sequences in each pleckstrin homology domain. Introduction of both mutations abolished the activity. These results suggest that this new binding protein binds PtdIns(3,4,5)P3 through two pleckstrin domains present in the molecule. Identification and cloning of centaurin-alpha. A novel phosphatidylinositol 3,4,5-trisphosphate-binding protein from rat brain. Using an affinity resin and photoaffinity label based on phospholipid analogs of inositol 1,3,4,5-tetrakisphosphate (InsP4), we have isolated, characterized, and cloned a 46-kDa protein from rat brain, which we have named centaurin-alpha. Binding specificity was determined using displacement of 1-O-[3H](3-[4-benzoyldihydrocinnamidyl]propyl)-InsP4 photoaffinity labeling. Centaurin-alpha displayed highest affinity for phosphatidylinositol 3,4,5-trisphosphate (PtdInsP3) (IC50 = 120 nM), whereas InsP4, PtdInsP2, and InsP3 bound with 5-, 12-, and >50-fold lower affinity, respectively. Screening a rat brain cDNA library with a polymerase chain reaction product, generated using partial amino acid sequence from tryptic peptides, yielded a full-length clone. The 2,450-base pair cDNA contained an open reading frame (ORF) encoding a novel protein of 419 amino acids. Northern analysis revealed a 2.5-kilobase transcript that is highly expressed in brain. The deduced sequence contains a novel putative zinc finger motif, 10 ankyrin-like repeats, and shows homology to recently identified yeast and mammalian Arf GTPase-activating proteins. Given the specificity of binding and enrichment in brain, centaurin-alpha is a candidate PtdInsP3 receptor that may link the activation of phosphoinositide 3-kinase to downstream responses in the brain. 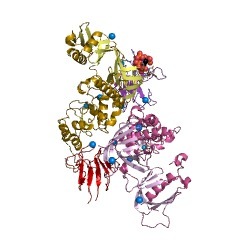 The ARF1 GTPase-activating protein: zinc finger motif and Golgi complex localization. 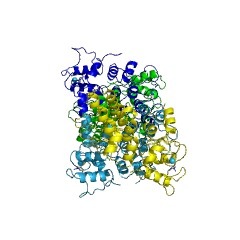 Hydrolysis of guanosine triphosphate (GTP) by the small guanosine triphosphatase (GTPase) adenosine diphosphate ribosylation factor-1 (ARF1) depends on a GTPase-activating protein (GAP). A complementary DNA encoding the ARF1 GAP was cloned from rat liver and predicts a protein with a zinc finger motif near the amino terminus. 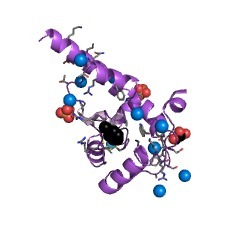 The GAP function required an intact zinc finger and additional amino-terminal residues. The ARF1 GAP was localized to the Golgi complex and was redistributed into a cytosolic pattern when cells were treated with brefeldin A, a drug that prevents ARF1-dependent association of coat proteins with the Golgi. Thus, the GAP is likely to be recruited to the Golgi by an ARF1-dependent mechanism. This information is based on mapping of SMART genomic protein database to KEGG orthologous groups. Percentage points are related to the number of proteins with ArfGap domain which could be assigned to a KEGG orthologous group, and not all proteins containing ArfGap domain. Please note that proteins can be included in multiple pathways, ie. the numbers above will not always add up to 100%.